Hunter Douglas ENERGY SMART STYLE rebates 2/1-4/25 2015 | Alcher Interiors, Inc.
Now’s the time to get special savings on select energy-efficient Hunter Douglas window treatments. 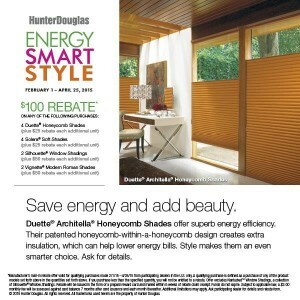 Now through April 25th, Hunter Douglas is offering $100 mail-in rebates on the purchase of 4 Duette Honeycomb shades or Solera Soft shades, or the purchase of 2 Silhouette or Vignette Modern Roman shades. With the Duette Honeycomb or Solera soft shades, each additional unit (beyond the 4) nets you an additional $25 rebate. And each Silhouette or Vignette Modern Roman shade (after the first four) is eligible for an additional $50 rebate. Click here to see which shades are eligible, and to view color and style choices.